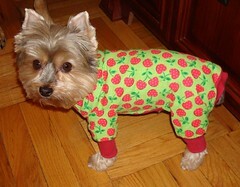 I received the CUTEST doggie pajamas today in the mail! My friend Fern from Flickr (say that 5 times fast) sent them to Shea. They were custom made to fit her & they fit perfect. Shea doesn't like wearing clothes but she seems to be ok with these pajamas. They fit around her arms and legs well & go right up the the armpit, they are also nice & thin. A lot of the shirts & jackets I've gotten in the store would hang a bit in the armpit & would annoy her as she walks, they would also be too bulky. These are so cute & Shea will be wearing them all the time! Check out her Etsy Shop! !